During their first rehearsal of this season, members of Highland Youth Pipe Band received their new kilts officially presented by Bill Fraser of Highland House of Fraser. The Highland Youth Pipe Band (HYPB) can now proudly wear The Pipers' Trail Tartan which was designed and registered by The Pipers ' Trail in 2008. The wearing of the tartan was permitted by Commander 51 (Scottish) Brigade, Brigadier David Allfrey. HYPB is the only band that has the privilege and honour of wearing the tartan. The Band is one of the seven Regional Music Groups which run as an extension to the tuition provided by The Highland Council's Instrumental Tuition Service. HYPB members are drawn from all corners of Highland and have been chosen after audition. Whilst many of the members receive tuition from Highland Council Instrumental Instructors, some have developed their skills in other ways. The HYPB is now only in its second year of existence, yet they have already performed at several prestigious events as well as their scheduled performances in the calendar of events for all Highland Regional Music Groups. The band has developed a healthy link with Armed Forces and boasts Drum Major Andrew Caldwell as the tutor for the drum corps. Norman Bolton, The Highland Council's Music Development Officer said: "Due to the diverse nature of Highland geography, it is difficult to meet for regular rehearsal sessions. It is, therefore, a credit to the commitment of these young musicians that they are prepared to travel, usually to Inverness, for residential weekend rehearsals throughout the year. These meetings are intense and tiring but can provide members with memorable musical experiences and life-long friendships." Pipers' Trail is an ongoing project run by 51 (Scottish) Brigade. The main aim of Pipers Trail is to work with educational establishments and local authorities to encourage and inspire young people to take up piping or drumming as a hobby or as part of their school curriculum. The Pipers' Trail team has already visited over 190 schools throughout Scotland and over 7000 pupils have benefited from the piping and drumming workshops. 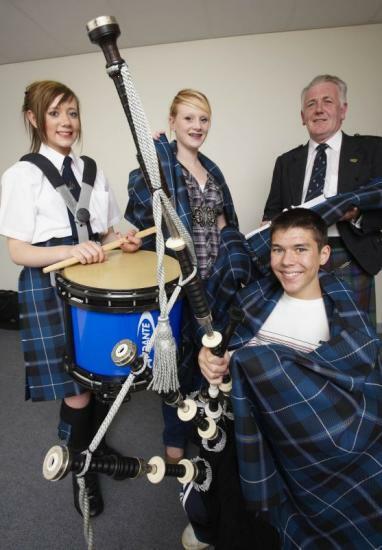 Highland Youth Pipe Band members (LtoR) Lauren Rattray (Millburn), Rachel MacDonald (Millburn) and David Stewart (Charleston) with Bill Fraser of Highland House of Fraser pictured getting measured for the new kilts.